The new design was introduced in 2009 and employers were given five years to implement the changes in their workplace. The deadline of Saturday 5th April for all employers to display the new 2009 Health and Safety Law poster is looming and ARCO, a leading UK safety supplier says it is making sure that businesses aren’t unknowingly caught out. 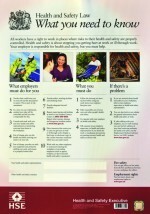 Employers have a legal duty to display the approved British Health and Safety Law poster in a prominent position in each workplace. In order to meet the new health and safety requirements, employers can now purchase a poster direct from Arco in a range of formats.